It's Weds, Dec 1 & we're enjoying the 90 degree sun with a light northeast wind off the island paradise of Isla Contoy ... 14 nm north of Isla Mujeres, Mexico. 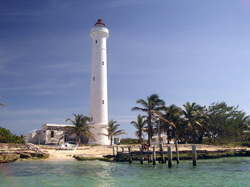 Isla Contoy is a Nacional Parque & a bird sanctuary. We mostly motorsailed here on Tuesday from Isla Mujeres where we've been since the last update. It's a bit tricky getting in-the charts are from the mid-1800's and soundings are far apart, at best! We were using a 10 year old cruising guide which indicated that we had to make a mile triangle off the west side of the island to get around some reefs & shallow spots. It was harrowing for a little while watching the depth gauge every few seconds. But we made it & we're anchored in about 11 feet of gin clear water just off the main visitors center/biological research station. Yesterday we met a young mexican biologist from Cancun, she told us that biologists come here for 10 day stays & then return to their homes on the mainland. As I write this, we can see the frigatebirds soaring above the island in large numbers, fish, porpoise & an occasional ray swim by-we're waiting to see a turtle swim by, but so far nada. The palm trees over on the beach are swaying in the gentle breeze. The wind has switched overnight to the north making it just slightly cooler than yesterday, but that also means no anchoring protection from the island which runs north south for 4.5 miles-it's less than a half mile wide. There are big sand dunes to climb to see the waves CRASHING on the windward side of the island which is all rock. There's a lighthouse at the north end of this island manned by 6 guys from the Mexican Navy. Once a week a gunboat comes by & resupplies-that was yesterday. We may take a ride in our dinghy this afternoon to see if we can visit the lighthouse-the cruising guide says the Navy guys are happy to have guests & will let you climb the lighthouse for a magnificent view of the island. The downside is that there's no place to land the dink, so if it's low tide, you can pull it up on some flat rocks, but we'll have to see. Since our last update, we spent 4 days doing the paperwork cha-cha. Checking into Mexico is an interesting challenge. Everyone is very friendly, but the new political administration changed the rules in August 2004 & no one's quite sure how it's supposed to go! We started the check-in process on Tuesday morning & each day were told to come back "manana"-finally got the paperwork on Thanksgiving Day! We had a great Thanksgiving Dinner with all the trimmings including the Colts vs. Detroit NFL football game at JAX, a little open air restaurant on the beach. We've also frequented the little mexican supermercados, got haircuts in an openair "salon", explored Isla "centro" (downtown), and generally relaxed. Mostly by ourselves, but also with Jim from Hand Basket (our buddy boat for the crossing) and Jeff & Abbey on No News, a 35' Wauquiez (pronounced Va-kee-A). Jeff & Abbey are a couple in their mid-20's who brought their boat from Chicago to Ft Lauderdale, who hope to go through the canal in February & be in New Zealand a year from now-too fast for our pace!!! Abbey brought us warm homemade english muffins one evening-we were the guineau pigs, or so she said-YUM! We blew up our microwave, apparently shorepower in mexico isn't regulated like shorepower in the U.S. Here it varies anywhere from under 110 to 130+! We took the local ferry into Cancun ($10 for both of us round trip) and then a taxi to WalMart-yes, WALMART!!! -- where we bought a new Panasonic microwave for $810 pesos (about $80 US). The new microwave seems perfectly happy on the boat, we only operate it off the inverter, never again on shorepower! The only slight difficulty is that it's labeled in 100% ESPANOL!!! I didn't think that would be a problem-all the instruction booklets in the U.S. are in english AND spanish-right?? NOT in Mexico! But so far, we've gotten along OK & I've reheated leftovers several times & defrosted pork chops when I forgot to put out meat for dinner one night. BUMMER! I asked Jose (the other guy at the marina) what "yeast" was in espanol - he checked with the laundry lady (she did 3 loads of laundry for us for US $1.40) and wrote it down. I took it to the other Isla grocery store & finally have my yeast to try making Abbey's english muffins. Each morning we listen to the NW Caribbean net-this morning net control was in the Rio Dulce & we could hear her perfectly. First they ask for emergency and/or medical traffic, then checkins from boats underway-you get to hear all the boats underway, usually 3-4, then weather from Dave on s/v Victoria in Roatan, Honduras-Dave does a great job with weather & between my daily buoyweather forecast & Dave's morning net forecast, so far we've been lucky! After weather is QSL-QSL is buy, sell or information needed. This morning a boat reported beachcombing yesterday & finding an artificial leg! He gave the lat/long & said he left it there in case the owner had just "forgotten" it, but that if anyone needed, he could go rescue it & bring it to them! Then they take checkins from everyone-probably 20 boats checkin each morning-Winterlude checked in for the first time yesterday & received a warm welcome from boats ranging from Isla Mujeres through Belize, Rio Dulce & Honduras! Yesterday a boat was sailing engineless into Colon, down by the canal & requested someone to meet them at the breakwater to assist them to come in. This morning we found out that LadyHawk made it safely! Jack & Linda, Tony & Vicky-it's on 8.188 USB on your SSB at 8 AM central time (Illinois time & Isla time). That's it for now. We'd love to hear news from home-it's Army week at the US Naval Academy & all the Midshipmen are busy playing pranks on upperclassmen in preparation for the big Army/Navy game on Saturday-GO NAVY!! !